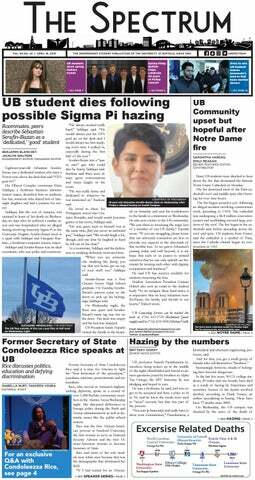 February is a notoriously hard month for UB students. Classwork and bad weather return in full force, making it pretty miserable. The Buffalo music scene, despite the low morale, continues to draw in big acts for local fans. The Spectrum assembled a collection of some of the most attractive shows and events happening around the area throughout the first few weeks of classes. Indie rock artist Andrew McMahon will be performing under his moniker Andrew McMahon in the Wilderness next week. He is best known for his 2014 single “Cecilia and the Satellite,” an indie-pop song dedicated to his infant daughter. McMahon is known for mixing contemporary instrumentation with modern synthesizers and digital effects. He will be touring to promote his recent album “Upside Down Flowers.” The album explores the artist’s past, relying heavily on lyrical nostalgia. The tracks “House in the Trees” and “Teenage Rockstars” highlight different points through his adolescence. The album also acknowledges his current relationships, including songs for his wife and daughter. The artist has experimented with a variety of different country subgenres but returned to his Oklahoma-styled roots for the latest album. Shelton’s musical message remains down to earth, despite his critical success. He explores different emotions within his relationships and nostalgia. “Nyla” came out after Ambrosius’ four-year hiatus. The album balances her heavy-hitting lyrical messages over her usual grooving sound. Bublé is known for his rich, powerful vocals. The artist lends his powerhouse vocals to new tracks like “I Only Have Eyes For You” and “La Vie en Rose”; romance ballads to draw in your mom and aunts from miles around. Multi-platinum selling artist Travis Scott is coming back from his halftime-show success to perform at the KeyBank Center this month. This is Scott’s third time in Buffalo, with the first being his 2016 Fall Fest show at Alumni Arena. But Scott has grown since then. And he has a number-one single, “Sicko Mode,” too. He gained critical acclaim for his uniquely ambient sound and his latest release is no different. His 2019 “Astroworld - Wish You Were Here Tour 2,” which supports his 2018 album “Astroworld,” will show off the record in all its glory. The album showcases Scott’s unique approach to lyricism and sound in trap. He revisits his expected rhythmic hypnotism, but the album features a variety of singles that combine musical genres and guests. The single “Stop Trying To Be God” samples a harmonica solo from the legendary Stevie Wonder and features vocals from James Blake. The rapper often features elaborate stage and lighting effects throughout his live performances. Expect to see a roller coaster and some theme-park-inspired stage work at the show.